Genoa in the sixteenth century ~ engraving from Civitates Orbis Terrarum, Braun & Hogenberg, Cologne, 1572. Note the lighthouse, some form of which has stood on the Capo di Faro since the twelfth century. Located on the northwest coast of Italy, the city of Genoa was the capital of the Republic of Genoa, which was founded in 1005 and flourished for nearly 800 years before it was conquered by Napoleon in 1797, when it became (briefly) the Ligurian Republic. At its height, the Republic of Genoa held territories throughout the Mediterranean and beyond including the island of Corsica from 1347 – 1768. Genoa was deeply involved in international politics during the Renaissance due to the immense wealth and influence of its banking consortium, and during the sixteenth century grand palazzi were built (inducing many designed by the famous architect Galeazzo Alessi) and the city attracted famous artists including Peter Paul Rubens and Caravaggio. During Molinaro’s lifetime, Genoa was governed by a Doge elected every two years from the Gran Consiglio, a ruling council consisting of representatives from the city’s wealthy aristocracy: a political system similar to that of Genoa’s traditional adversary, Venice. It is uncertain exactly when or where Simone Molinaro was born – sometime between 1560 and 1570 (probably closer to the later date) and if not in Genoa proper, perhaps in nearby Gazzolo (now Campomorone) where his family owned property. He apparently lived his entire life in Genoa, although he may have traveled to other cities in Italy for various professional reasons, including his work for the church and his publishing activities. Nothing is known about his childhood. In 1589 he appears as the composer of the sestina L’aura che già di questo in the Secondo libro di canzonette a quattro voci by Giovanni Battista Dalla Gostena (ca. 1555 – 1593), which also describes Molinaro as Dalla Gostena’s nephew and disciple. Molinaro received his musical training from Dalla Gostena, who in turn had studied with Philippe de Monte in Vienna, probably in the early 1570s. 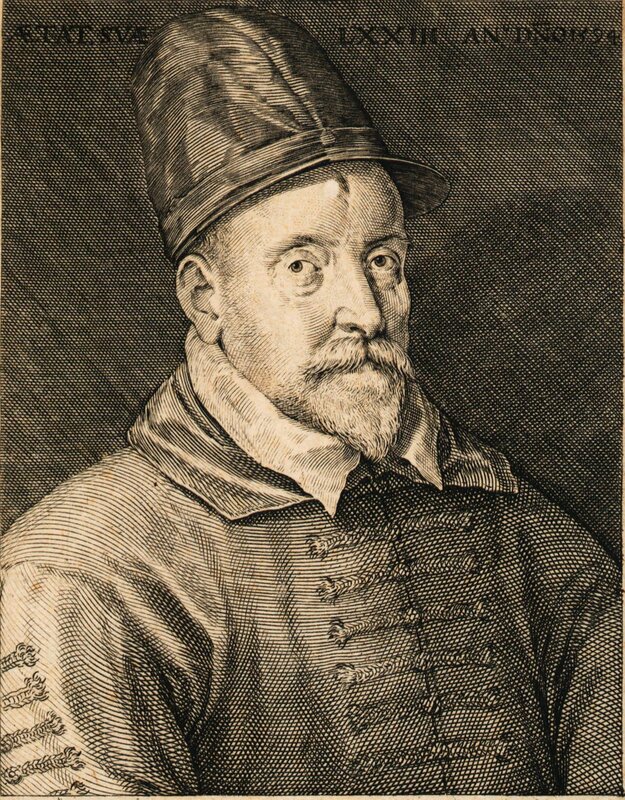 A contemporary of Orlande de Lassus – with whom he was compared – Monte was a Flemish composer who worked at courts across Europe throughout the sixteenth century, was widely published, and was renowned for his voluminous output – over 1100 secular madrigals alone! Dalla Gostena, and in turn Molinaro, evinced Monte’s influence in the manner and extent to which the polyphonic techniques of the Franco Flemish school informed their compositions. Dalla Gostena was shot and killed (perhaps in a dispute over a love affair) in September 1593, from which time on Molinaro was left to make his own way in Genoese musical circles. In 1595, he published Il primo libro di canzonette a tre e à quatro voci, a collection of his own vocal works printed in Venice by Angelo Gardano – his first book. That same year he edited for posthumous publication a collection of his uncle’s madrigals, Il secondo libro de madrigali a cinque voci – also printed in Venice by Gardano. These books were the first in a steady stream of publications that Molinaro would produce over the next two decades and eventually lead to him owning his own print shop. 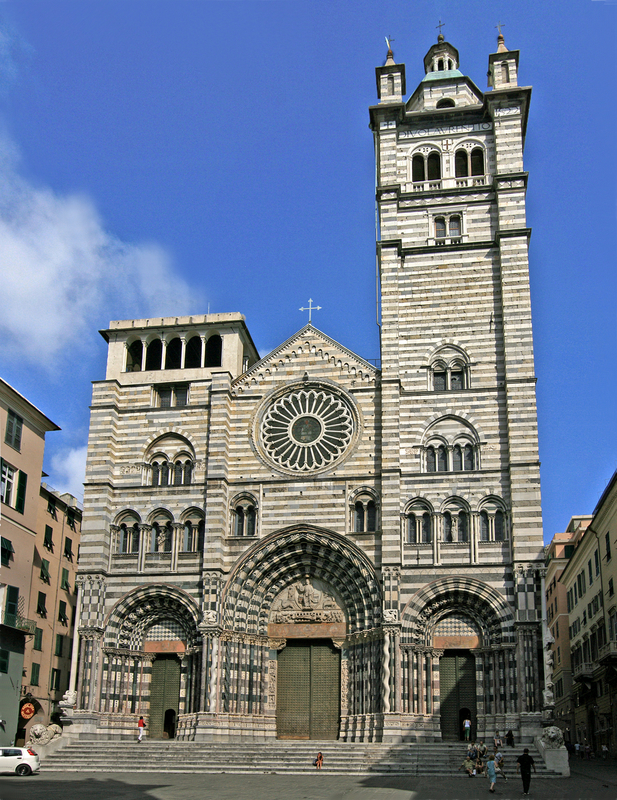 The Cathedral of San Lorenzo, Genoa, where Molinaro served as maestro di cappella 1601-1617. It was completed in the seventeenth century and looks much the same today as it did during Molinaro’s lifetime. On December 23, 1595, he entered the priesthood – clerical status was a requirement for service in the Cathedral of San Lorenzo. Molinaro served as a musician there beginning in 1598, and served as maestro di cappella at the cathedral from 1601 – 1617, when he was dismissed. He had received a papal dispensation that released him from his clerical vows in 1614, and in 1615 he married Geronima de Franchi, a widow with four children, at least two of whom – Giovanni Battista Aicardo and Giacinto Aircardo – were musicians who worked with Molinaro (Giovanni Battista in fact inherited Molinaro’s property upon the latter’s death). So it’s possible – even likely – that he lost his job at the cathedral because he got married. Records indicate that Molinaro began to work as a musician at the Palazzo Ducale (Doge’s Palace) beginning as early as 1608, and he was elected chapel master there in 1625, remaining in that position until his death, recorded on May 16, 1636. (Simone Molinaro was)… a musician whose work bridged the period of the late Renaissance and early Baroque, and encompassed the realms of church, state, and court. Among his early publications, four of the first five extant collections printed before 1601 are of secular music. By inference through the information gleaned in the dedications of these publications and in other documents, it can be ascertained that Molinaro’s early career was spent cultivating the patronage of the nobility and in the circles of the literati in Genoa. The bulk of his compositional activity, however, stems from his term as a church musician from 1601 to 1617, and the majority of the currently known publications from this time (eight out of nine total) are sacred. Within this body of work can be observed a shift in style towards the new elements characteristic of the early seventeenth century. Title page of Molinaro’s 1613 edition of Gesualdo’s Six Books of Madrigals for five voices. 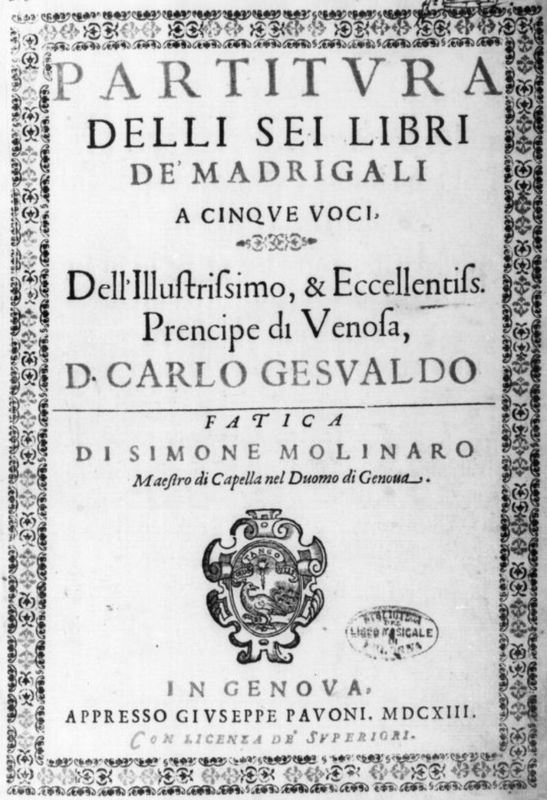 Before 1612, Molinaro hired printers in Venice and Milan to produce most of his books (almost entirely choral music: his own compositions, as well as those of Dalla Gostena and others), but he hired a local printer in Genoa named Giuseppe Pavoni to print his 1613 edition in score of Carlo Gesualdo’s six books of madrigals for five voices. Shortly after this he must have established his own print shop in Loano (about forty miles from Genoa), for he brought out an edition of madrigals there in 1615. This business (the print shop) never worked out satisfactorily for Molinaro – he was unsuccessful in attempts to obtain the monopoly required to move the shop to Genoa, endured litigation and financial burdens on its account, moved the shop to Nice, and was still dealing with difficulties arising from it on his deathbed (his heirs finally sold the shop in 1650). Today, most of his music “languishes in obscurity”. Ironically, Molinaro is best known to musicologists, scholars, and musicians today not as a composer in his own right, but rather as the editor who produced the first score edition of Gesualdo’s madrigals, in the year of the controversial composer’s death. That Molinaro lavished great care on the edition and displayed, in general, an exceptional understanding of sixteenth-century madrigal techniques, and in particular of Gesualdo’s personal style, is apparent in several details associated with the printed collection. 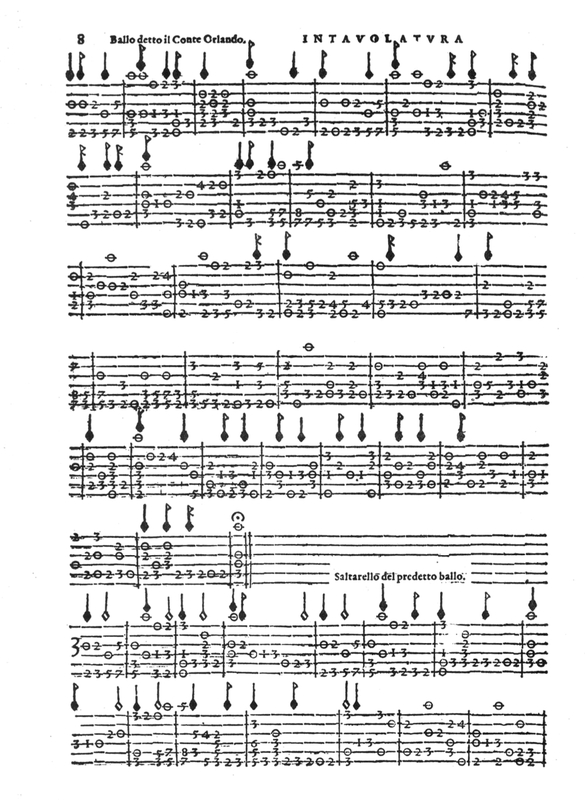 Molinaro’s use of a score arrangement can be viewed on one hand as an effort by him to display the intricacies of the music through close comparison of the voice parts, and on the other as an act of sheer veneration of Gesualdo’s “sacred melodious pearls dipped in the basin of eternal beauty”. ~ Peter Poulos, ibid, p. 70. Christopher Morrongiello performs “Ballo detto il Conte Orlando” from “Intavolatura di liuto, libro primo” (Venice, 1599) by Simone Molinaro (ca. 1565–1615). Filmed in the Chapel from Le Château de la Bastie d’Urfé at The Metropolitan Museum of Art. …one of the finest collections of instrumental music of the Renaissance. …since 1605 (Molinaro) had been working with the instrumentalists and singers of the chapel of the Palazzo Ducale, the most important musical institution of the entire Republic. Although we have no direct evidence concerning the instrument he played in these ensembles, it is interesting to note that the official documents of the period begin to mention of the use of the theorbo in performances held in the Palatine chapel. Moreover, a few years later, when Molinaro was unable to perform on account of ill health, he was replaced by Geralamo Gallo, who was also a theorbo player. It thus seems likely that the theorbo was Molinaro’s main instrument. Gostena’s influence on Molinaro was profound. After his uncle’s death, he included dozens of Dalla Gostena’s pieces in the music prints he published. Simone Molinaro produced a single book of music for the lute in 1599. He was a relatively young man at the time, and Dalla Gostena’s death still recent. 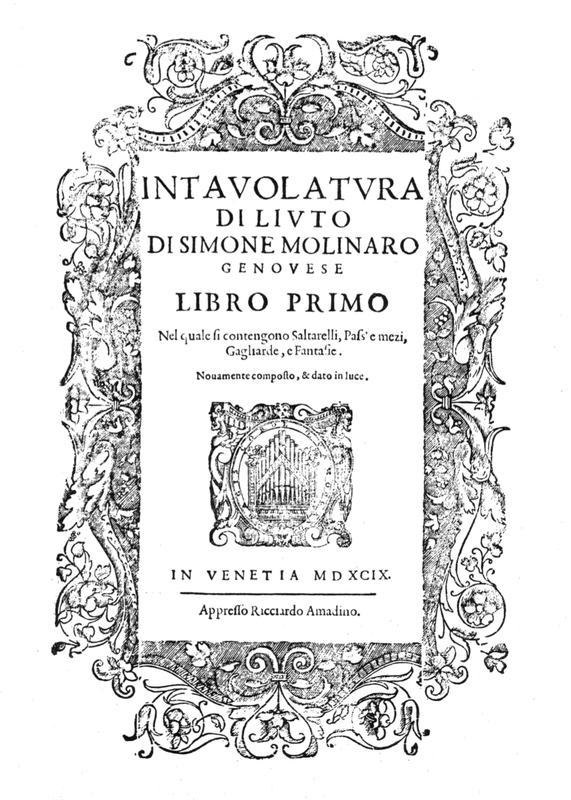 Intavolatura di Liuto Libro Primo includes not only 39 pieces by Molinaro but 28 by his uncle (and one by Giulio Severino, a contemporary Neopolitan lutenist). The beautifully printed book collects together fantasias, dances, intabulations of vocal works, and sets of variations on the passamezzo, a ground bass that was popular among lutenists as a display for invention and improvisation. Of all these warm and tuneful lute pieces, only one is likely to be familiar to audiences today. Italian composer Ottorino Respighi (1879 – 1936) orchestrated Molinaro’s Ballo detto il Conte Orlando for the opening movement of his Ancient Airs and Dances Suite No. 1 (1917), which has been performed and recorded by orchestras around the world. The eleven passamezzi – each variation set coupled with its own galliard – gather together a remarkable array of effects, timbres, and melodies that stands out from passamezzo variations I have encountered in other sixteenth and early seventeenth century sources (primarily English manuscripts). Molinaro explores every register of the lute and many technical challenges through these pieces – they are like a collection of etudes for the instrument. Many of them are extensive, and demonstrate seemingly endless invention on Molinaro’s part, like that of a virtuoso jazz musician whose improvised solo continues to build in intensity, chorus after chorus. These are some of the longest pieces for Renaissance lute I have encountered. Several of Molinaro’s passamezzi are two or three times as long as most conventional pieces in the historical literature, and the longest – the tremendous Pass ‘e mezo in quattro modi – holds forth for ten 32-bar choruses and takes more than thirteen minutes to perform. In addition to the influence of Philippe de Monte received through Dalla Gostena, Molinaro’s fantasies exhibit stylistic characteristics he would have absorbed from the music of other sixteenth century composers such as Palestrina and Victoria. Molinaro’s fantasies exploit a rich palette of contrapuntal resources including imitation through inversion and retrograde, resulting in music of great elegance and architecture. Molinaro and Gostena composed for the lute if they were writing vocal music, by insisting on contrapuntal integrity at all times, no matter what the technical demands made on the player. Most contemporary lutenists, including John Dowland, allowed for occasional compromises in their counterpoint by dropping or altering a voice if it made for easier, more flowing left-hand positions. Molinaro does not make any such compromises; rather he requires the lutenist to maintain all contrapuntal voices as if he were performing a madrigal or motet. Molinaro uses the entire range of the instrument in a way unlike any other lutenist, even going so far as to finger the bass strings high up on the fingerboard to create unusual colors and chord voicings. The music rivals Dowland in terms of beauty, variety and invention, combining elegantly flowing contrapuntal lines with lovely serene melodies, jazzy rhythms and virtuosic improvisatory passagework. Indeed there are several passages in common between Molinaro and Dowland, which suggest the Englishman may have met Molinaro or heard him play during a visit to Genoa in 1595. This uncompromising approach to composition for the lute results in music with great structural integrity, but it also makes great demands on the performer. These are some of the most difficult pieces to play in the Renaissance lute literature. 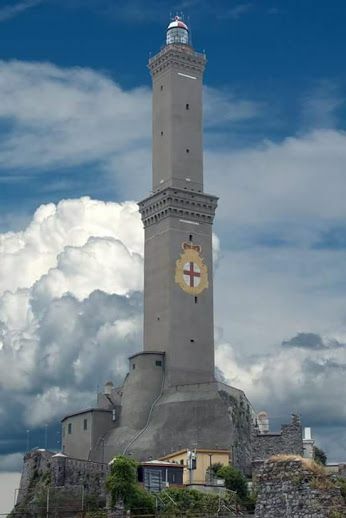 The lighthouse of Genoa that stands today was built in 1543, and was a daily feature of Molinaro’s life. For centuries it was the tallest lighthouse in the world. Molinaro’s lute book was one of the last books of music for the lute to be printed in the sixteenth century (Giovanni Antonio Terzi’s Il Secondo Libro de Intavolatura di Liuto was printed in Venice the same year), and in many ways is like a summation and synopsis of sixteenth century Italian solo lute style. The lute pieces it contains – though refined and beautiful – are musically conservative, and share the same aesthetic ideals, harmonic language, and musical forms as the music of Francesco da Milano and his contemporaries from the beginning of the century. Exquisite and profound though the music heritage from the cinquecento was, some of Molinaro’s contemporaries were already looking ahead to the changes and innovations the new century would bring. Giovanni Giralamo Kapsperger, his slightly younger contemporary from Rome, would print his Libro primo d’intavolatura di chitarrone in Venice only five years later in 1604, ushering in a new era in Italian lute music. John Dowland visited Genoa in 1595. While there is no record that he met Simone Molinaro when he was there, it is possible, even probable that the two lutenists would have encountered each other and sought an opportunity to share with and learn from one another. Dowland may have been a few years older (he was 32 in 1595), but the two men were close contemporaries, and among the finest lutenists of their generation to be found anywhere in Europe. However, by the time he made it to Genoa, Dowland’s paranoia was mounting: he feared that those in power at home in England might misperceive his activities as evidence that he had become embroiled in a Catholic conspiracy against Queen Elizabeth. He left Italy before accomplishing his goal of meeting Luca Marenzio in Rome due to these fears, and they may have prevented him from fraternizing with the young man. Molinaro was not yet a priest, but he was probably well on the way by then, as he would undergo the rite of tonsure later that year. Yet… Dowland was a volatile and unpredictable personality, and the pool of professional musicians in Genoa was not large. He may very well have sought Molinaro out, keen to meet a kindred spirit who practiced the same craft. They had much in common. It is romantic to imagine the two of them sitting together late into the night in Genoa, perhaps in a room or on a balcony with a view of the harbor and the lighthouse, drinking wine and playing exquisite lute music for and with each other. That would have been something to hear. By walterbitner in Music, Renaissance, The Lute on April 6, 2019 . Thanks for this essay on Molinaro, well up to the high standards of your blog. I would add that lutenist Paul O’Dette made a fine recording of the lute music arranged (beautifully) by Ottorino Respighi in his ‘Ancient Airs & Dances, Suite 1-3′, including the Ballo detto il Conte Orlando’ and ‘Saltarello del predetto Ballo’ -HELIOS CD CDH55146. Also, Gilbert Biberian published a set of arrangements for guitar, ‘Saltarellos & Fantasias’. Thanks for sharing about these resources!